When it comes to data, a little bit of skepticism goes a long way. People are often willing to accept sales performance statistics without thinking critically about the information or methodology behind the numbers. They’re even more willing to unquestioningly accept data that’s presented in the form of a pretty and easy-to-read chart. However, you should exercise caution. Numbers don’t always lie, but they can be manipulated or exaggerated. If someone wants to tweak a graphic to make the data look better or worse than it really is, it’s incredibly easy to do so. As a sales leader, you know how important it is to keep a careful eye on your team’s sales performance metrics. But how can you tell if the data you’re seeing is misleading or inaccurate? Don’t be easily fooled by sneaky graphics and unclear charts. Here are the warning signs to look for when your data visualizations are lying to you. It’s the oldest trick in the book: change the values on the X or Y axis of a graph and make it look completely different. You can easily exaggerate an increase or minimize a decrease, all with a slight shift in the numbers on one axis of the chart. But does it really? 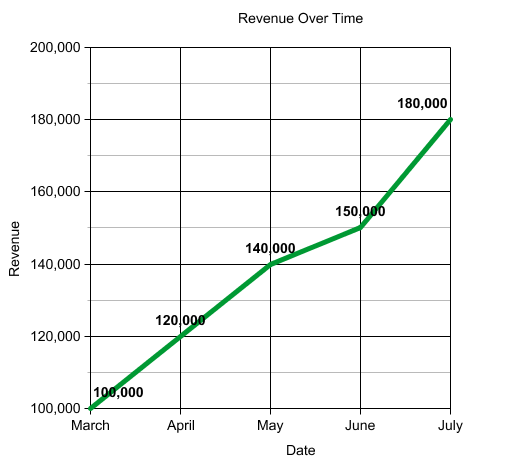 Before you accept the data visualization at face value, look more closely at the X and Y axes of the graph. If you read carefully, you’ll realize both graphs represent the exact same data. However, the left chart was slightly manipulated, starting with data points at $100,000 instead of $0. This makes the increase in the left chart seem much larger than it truly is. 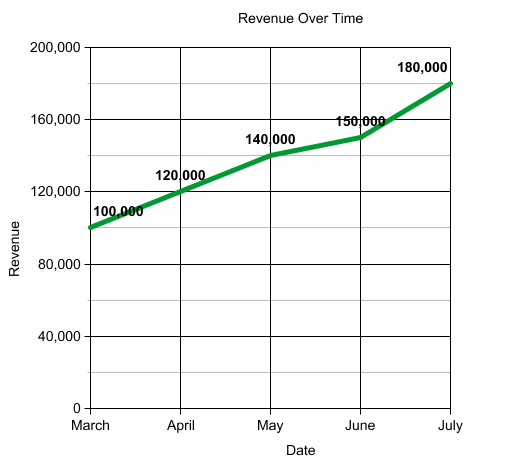 The scale of a chart’s axis is a simple visual trick, but powerfully misleading. 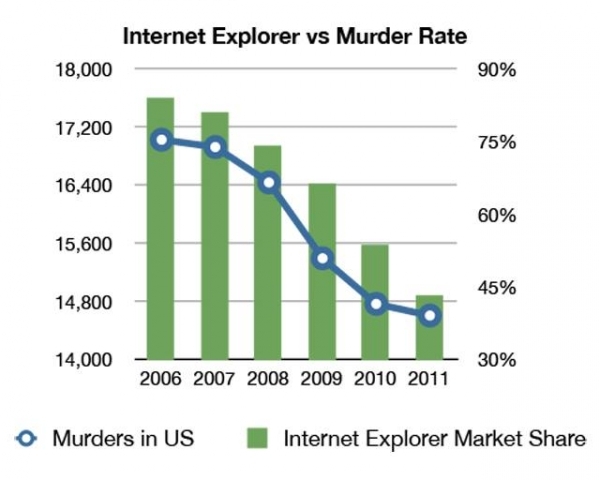 If you didn’t know better, you’d be convinced that Internet Explorer use causes murder! Obviously, this is just a coincidence, not a conspiracy of IE users. But the next time you’re tempted to draw conclusions based on correlations between data, remember this ridiculous image and don’t assume correlation is anything beyond coincidence. Another data danger is focusing on meaningless metrics that don’t offer you any valuable information. If, for example, you see a comparison between two different graphs or data points, make sure that they’re measuring the data by the right criteria. For example, if you look at total number of calls made per week, you may think that John Brown is infinitely better at his job than the rest. However, number of calls is just a vanity metric, and doesn’t really tell you how well the rep is doing his job. You need to understand the effectiveness of his activities and the conversion rates down the sales funnel. 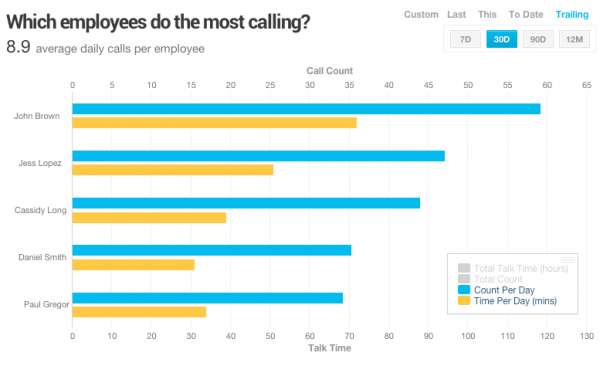 This second graph shows you not just how many total dials reps make, but the effectiveness of those activities in converting a call into a meeting, and a meeting into an opportunity sourced. 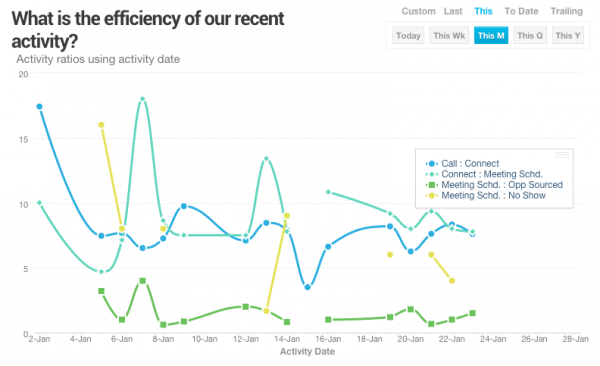 You can actually see the conversion rates as reps are able to move opportunities to the next sales stage. These metrics don’t just show you the activities at the top of the funnel, but the results at the end of the funnel as well. It can be a little intimidating to call out a chart as being misleading or meaningless, but it’s vital for you as a sales leader to understand the right metrics. With this guide, you’ll be able to quickly identify misleading, inaccurate, or useless data visualizations when you see them.